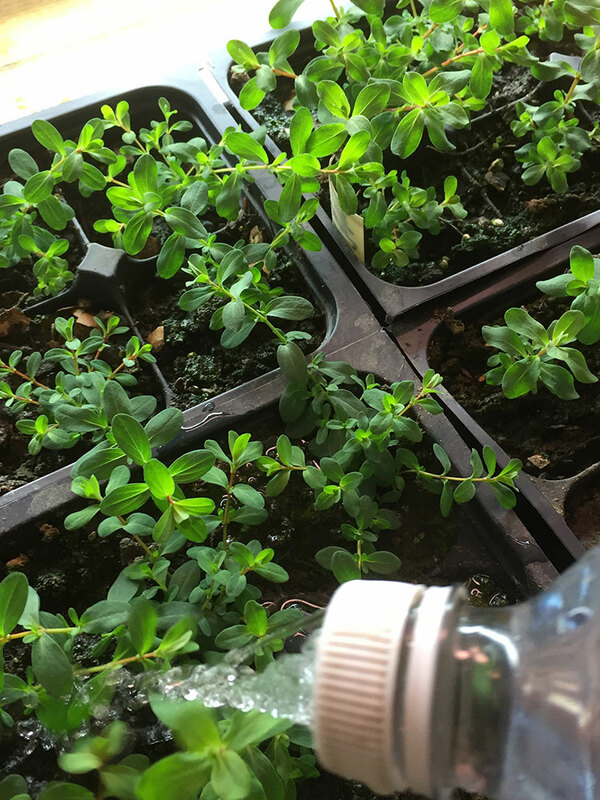 Seedlings growing in recycled materials! 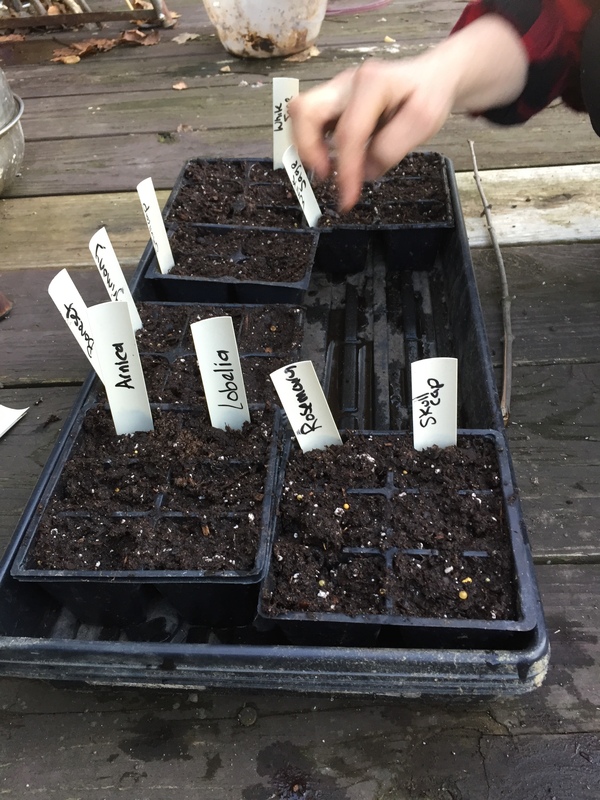 The spring is a wonderful time to begin starting your seeds–and here in Western PA, we just crossed the “eight weeks before last frost” threshold, so it is a bit of an urgent matter! This means that this weekend is the time to start many of the warm season crops and perennial herbs. 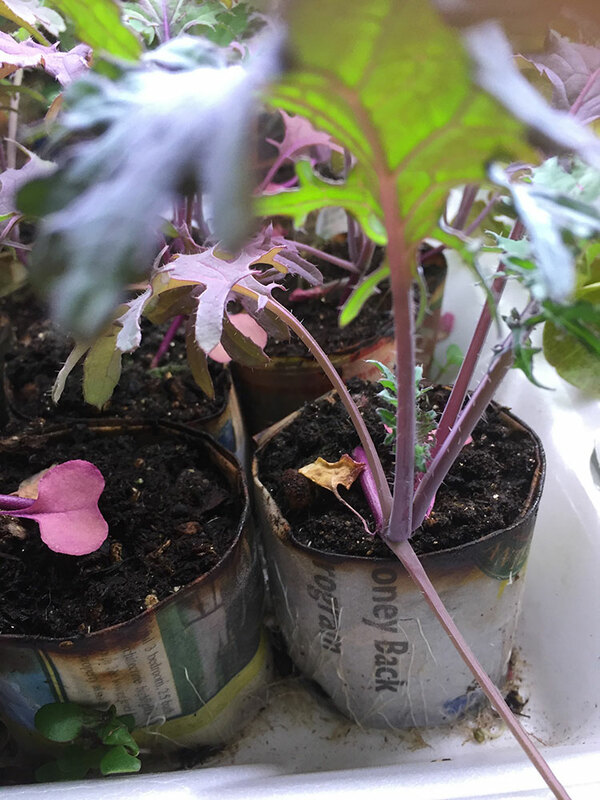 Today’s post takes a “recycled” spin on seed starting to share with you a number of tricks for seed starting all using recycled and repurposed materials (drawing upon the permaculture principle, “waste is a resource”). 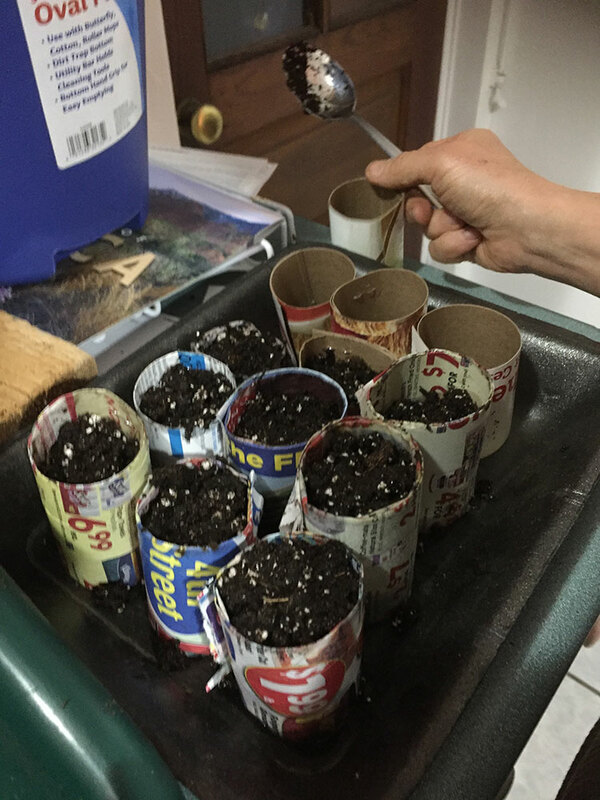 For these seed starting options, we are making use of many typical “trash” and “recycle bin” products: newspaper, styrofoam take-out trays, two-liter soda bottles, and Venetian blinds. Even if your household doesn’t produce this stuff yourself, a simple walk down any suburban or town street will likely yield more of these materials than you’ll likely ever need. If you want to know more about seeds and how to develop a good seed starting setup, you can visit my earlier post. I also have written about the kinds of seeds to start and my spiritual insights on seed starting in earlier posts. For really small seeds that need to be sown on the surface (like chamomile), watering them with a regular watering can or small indoor plant watering can dislodge the seeds. Then, the seeds flow to the edges of your pot and then sprout along those edges. However, a good farmer friend showed me this trick to create a very effective seed waterer using a two-liter soda bottle. This waterer offers a very gentle watering system that doesn’t dislodge seeds (it also allows for uniform watering quickly of many different seed starts). Instructions: You simply take a very small drill bit and drill in a series of holes, like below. 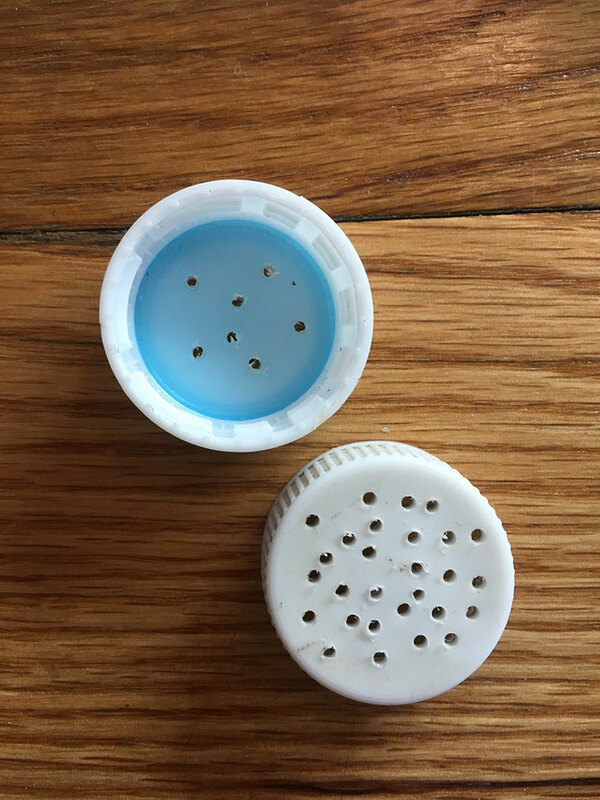 The more holes you drill, the faster your water will come out (so you might want a few different options). 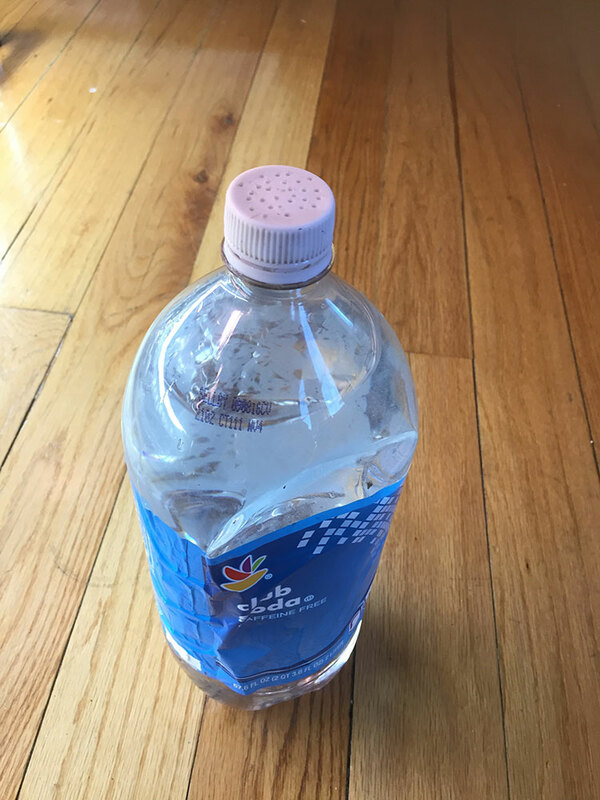 Once you’ve drilled your bottle, you fill it with water and water away! Squeezing the bottle gently gives you a wonderful sprinkle that is just the right size for your seedlings and is kind to the tender plants. Here I am watering some st. johns wort plants. Venitian blinds made of plastic are in widespread use but often end up being a waste product. Personally, I can’t stand the things, but I’m glad to have found a real use for them. If one or two of the smaller flimsy plastic blinds break, they are typically thrown away. Larger ones eventually also are discarded. We see this here a lot in my college town–you can probably pick up a dozen or so of the discarded sets of blinds within a year’s time if you keep an eye out. 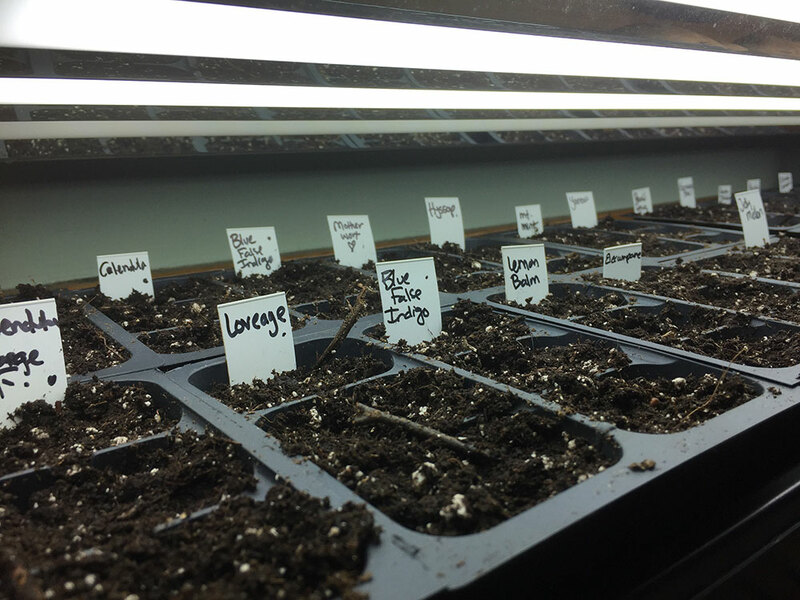 What a friend of mine taught me some years ago was a simple trick to create labels for your seedlings and outdoor plants: using Venitian blinds and marker. 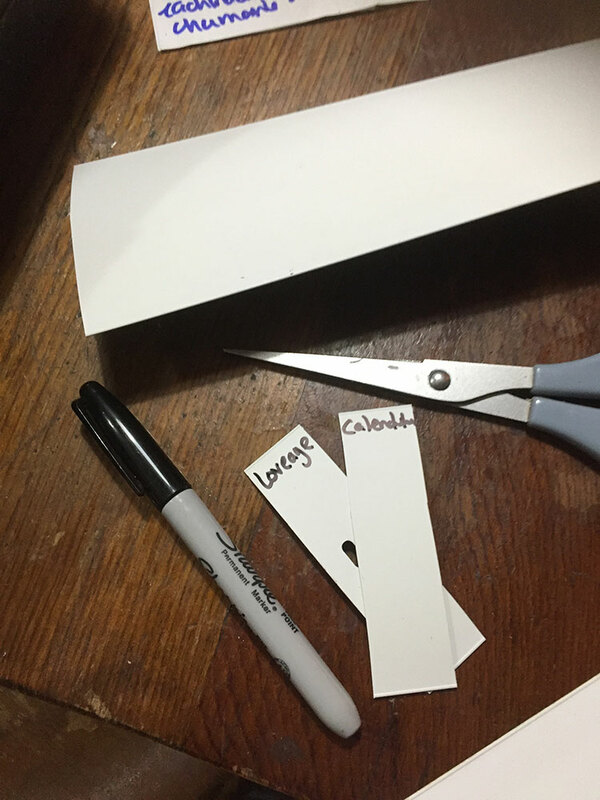 Cut up Venetian blinds actually make a wonderful choice for labels because they are hardy and don’t break down. The only potential challenge is that if you use a sharpie on them, the marker will eventually fade in the sunlight (not a problem for seed starting, but can be a problem for planting out). Materials: Venetian blinds of any size, scissors, sharpie marker. Any kind of blind works: you can use both the larger blinds (as in the photo) or the smaller blinds; both cut with a simple pair of scissors. Once you’ve cut them, simply label them and stick them in your pots (paper or plastic; In the photo below have some hand-me-down plastic pots with Veneitan blind labels–some of the seeds I started this week). 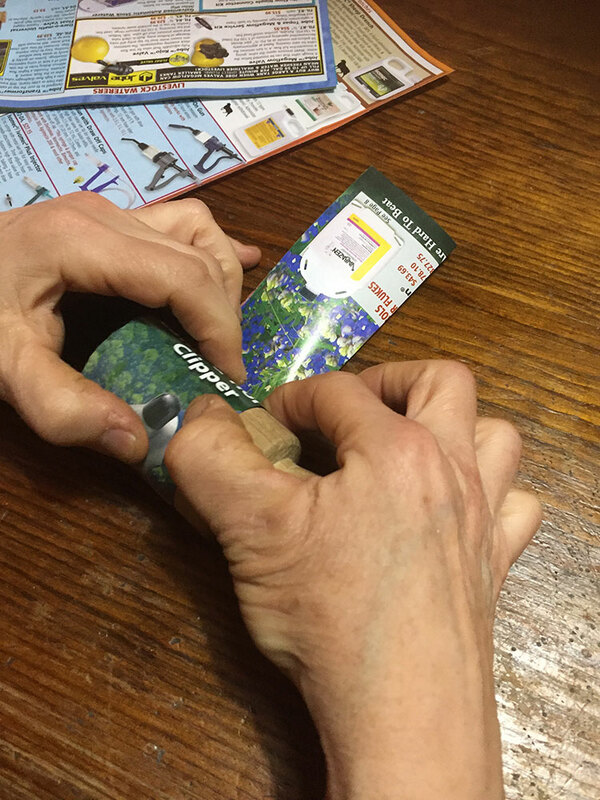 The labels can be used year after year; even if the marker fades, you can simply replace it. 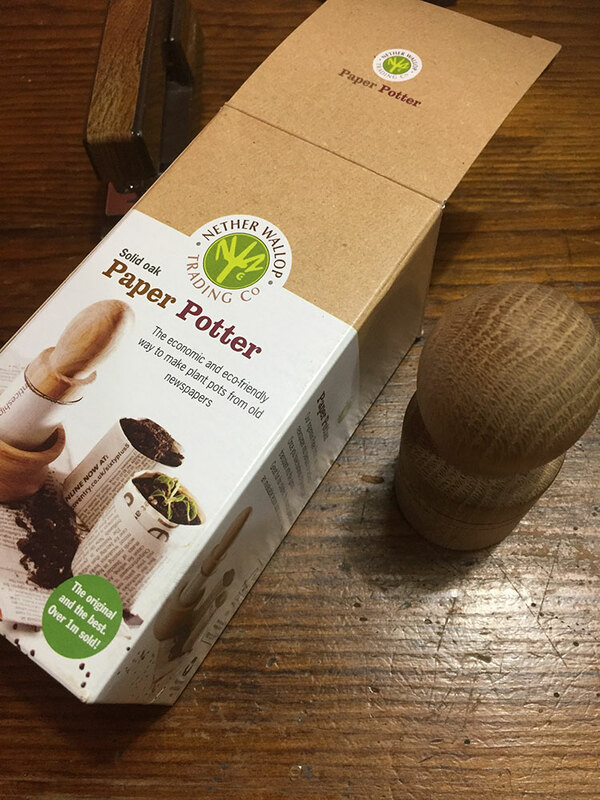 This year, a friend and I experimented with these paper pot makers from the UK. 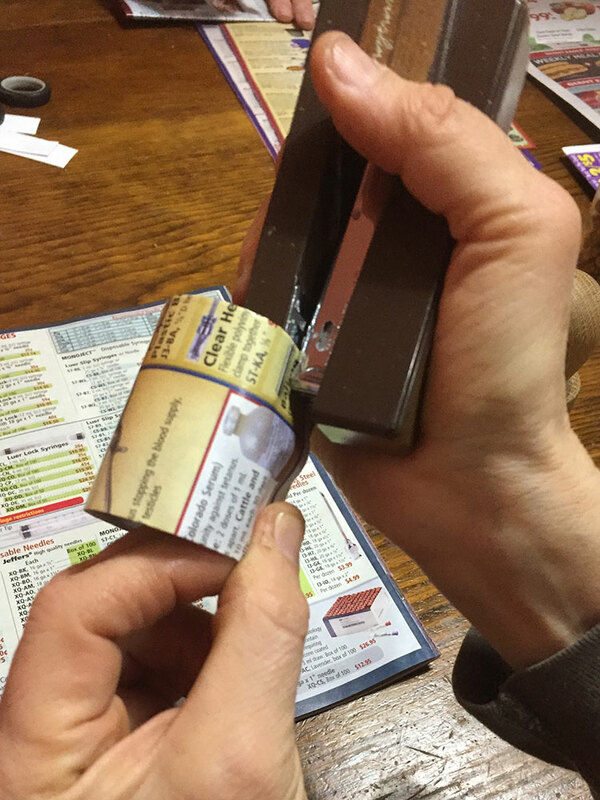 They are nice–you roll up the pot, and then, the pot maker kind of crunches up the bottom as you twist it on a wooden base. After some experimentation and modification, however, we found an even easier way to make these pots–with an added benefit of a bottom watering option using recycled take-out trays. Paper pots ready for planting! The process we developed doesn’t even need the paper pot maker–any jar (like a vitamin jar or spice jar) will easily do the trick. Materials: Newspaper (preferably black and white, as this has soy-based inks), stapler, recycled styrofoam or plastic tray. 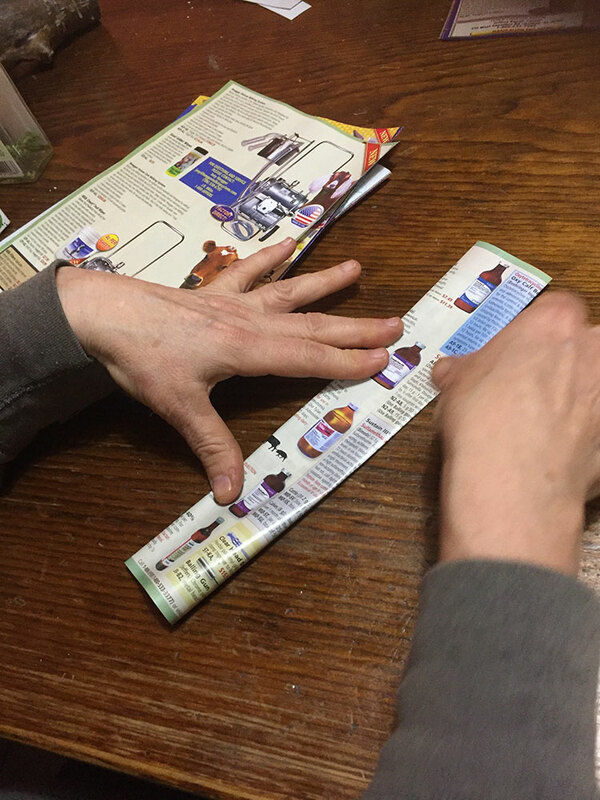 First, you fold your newspaper into the right size. Now, you staple it or fold in a corner to hold it together. Now, we place the pot, with the open bottom, into a recycled take-out tray and fill each with soil. A spoon works really well for this purpose (although I prefer to get my fingers right in the soil). If you put your soil in a bucket and make your soil wet (getting it to the consistency of brownie batter) your pots will fill very easily and then you don’t have to try to water the seeds after planting them (dislodging them). Filling the pots with soil! 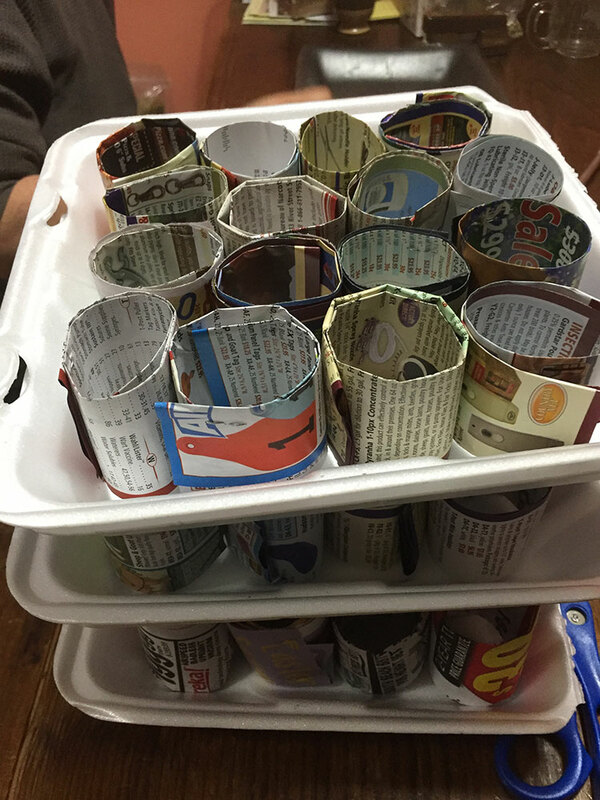 These paper pots hold up pretty well over time. We’ve noticed that when the plants outgrow them, they start to break their roots through the pot (see photo below). This is a good sign to plant out or transplant into a bigger pot! Ready to plant–roots coming out! Not to mention they look really cool by comparison to other plastic options. Beautiful trays of paper pots! 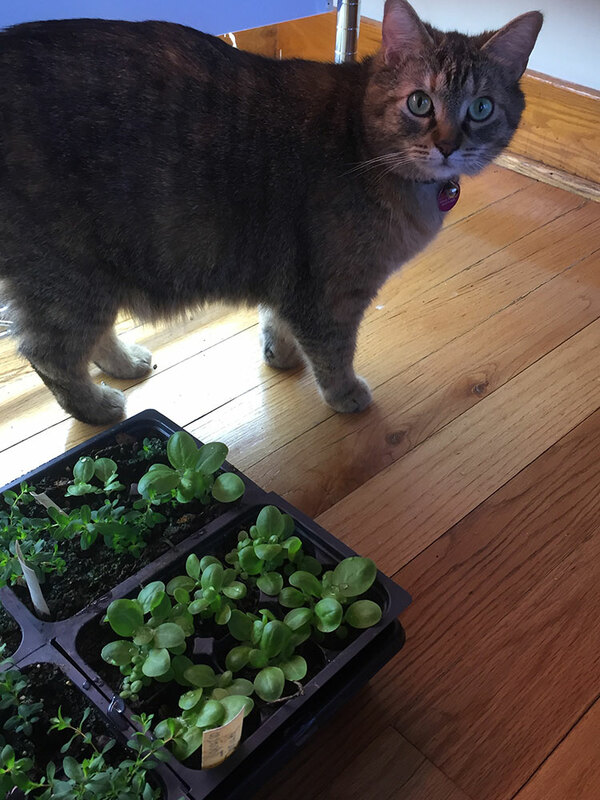 And don’t forget–seed starting is serious business! Someone needs to check your work. Here is our inspector general, Acorn. I hope that the blessings of the spring are upon each of you! If you have any other good tips for recycled/repurposed seed starting or growing ideas, I’d love to hear them :). A few words about the spring equinox–the spring equinox is a time of balance, when day and night come in equal parts. The spring equinox is a great time to clear away the old habits and clutter that no longer serve us and that pull us back into unsustainable patterns and behaviors. The spring equinox is also a great time to start new activities, hobbies, actions, or even reorient our way of seeing. Given the energies of the Spring Equinox, I’ve compiled a list of things that you can do to help engage in more sustainable and earth-centered practices during this most sacred time! I like celebrating the eight-fold wheel of the year because it brings a sense of ritual and consistency into my life. I have crafted a series of “personal rituals” for each of these sacred days (like the inner spring cleansing, the first item below), and doing these with regularity each year gives me some balance and focus. So you might also think about how your own personal ritual and spiritual work fits with the season at hand. Spring Cleansing/Balancing (Inner). The spring equinox is a time when the darkness and light are in equal balance. And truly, this is a time of balance, a time of introspection when we can understand how to achieve inner balance in our lives. I think this is important because so many of us don’t take the time to do such balancing and cleansing work in this busy world, and an inner imbalance can lead us towards all sorts of outer imbalances and cause chaos and pain for us. How does one seek inner balance? One suggestion is a practice I started few years ago on the spring solstice: I started with a list of all of the things that make me happy: writing, painting, being outside, being with family and friends, growing things, spiritual practices, sitting by the fire, spending time in the woods, teaching, mentoring my students, etc. And then I kept track of how much time I spend on everything for one week–its like a time diary. I kept track of it as precisely as I could (if anything took more than 5 minutes, I wrote it down). After one week, I evaluated how I did and how many minutes, of my 24 hours in each day, I spent doing things I really loved. I also meditated on the list, trying to work through my week, and worked to eliminate anything that wasn’t helping me. The following week, I tried to increase the time I spent on my favorite things by 5%; then I again evaluated my successes. Slowly, over time, I was able to clear extraneous things and time sinks (like Facebook!) and focus really on what made me happy. This led to inner balance and, honestly, a new way of seeing and living. To keep myself on the right track, I do this activity each year for at least a week as part of my spring equinox celebrations–to reinforce my goals and spiritual path. Spring Cleaning (Outer Living Spaces). Now is also a great time for outer work–work that can help you live simply and more meaningfully. Part of the reason we have “spring cleanings” is that spring is really a great time for all kinds of cleansing work. The accumulation of excess stuff that we don’t need can energetically hold us back and keep us from moving forward. For example, I had a friend who had a serious accumulation of things–a lot of it was junk, but it had piled up in his living space to the point where he couldn’t walk or really do anything. He would spend many countless hours and days organizing his things, but the stuff always seemed to get the best of him because while he shuffled it around, he never actually got rid of anything, so the clutter and energy remained. Eventually, he was forced through external circumstances to do some serious spring cleaning–and energetically, his creativity started to flow again.I found this to be true with myself as well–after some life changes, I ended up unloading about 40% of my stuff–with each bag or box I donated, I felt lighter and happier. I’m in the process of unloading even more stuff to prepare for some more big life changes this summer. The more I donated and rehomed, the easier it was to let go of more. The clutter really does stagnate us energetically and harms our living spaces and inner work. Once we’ve done such an external spring cleansing, we can evaluate what is really needed for a happy and fulfilling life and only bring those things in that fulfill us, not bog us down. Foraging for Spring Greens. Depending on where you live and the temperatures in the year, in the next few weeks, you can likely begin foraging for the first spring greens. In my neck of the woods, these are cattail shoots and poke shoots (both to eat like bamboo shoots), dandelion greens, nettles, burdock root, and a bit later in the season, ramps. For the poke, you can have them as long as there is no pink or red coming up the stalks. Spring Tonic Greens and Tonic Teas. Unsurprisingly, once you are able to find those spring greens, they make a great spring tonic blend. The idea behind a tonic tea is that the winter would leave one rather malnourished–so the early spring greens and roots often helped to nourish and revitalize the body. This is not a “cleanse” in the popular sense of the word but more of a revitalization for long health. There are lots of ways to make a tonic blend using the early spring greens–you can make up a spring greens stir fry (with dandelion greens, nettle, and burdock root) or you can just make yourself up a dandelion root-nettle tea. Regardless, the early spring greens can be consumed early and often and will leave you feeling revitalized for the coming months! Evaluating Spending and Reducing Excess. Part of the challenge for those of us living in western industrial civilization is that everything encourages us to spend, buy, and consume, very often when we don’t need it. think there is often confusion over what is a need and what is simply a strong want. This is a good time to year to analyze spending habits and work to reduce excess (a great book for this is called Your Money or Your Life and it will help you break down your necessities and what you really need–a fascinating and highly recommended read). Evaluating spending and reducing excess in our lives is well-suited to be combined with any external or internal spring cleaning we are ready to enact. Planning a sacred space. Early spring is still a great time for thinking about creating outdoor spaces–either on your own land or in out of the way nooks and crannies in public lands. I have found that the longer I hold an intention of creating such spaces in my mind, the better such spaces become when I enact them in the world. Meditation and visualization to plan the right kind of sacred space is useful as well. 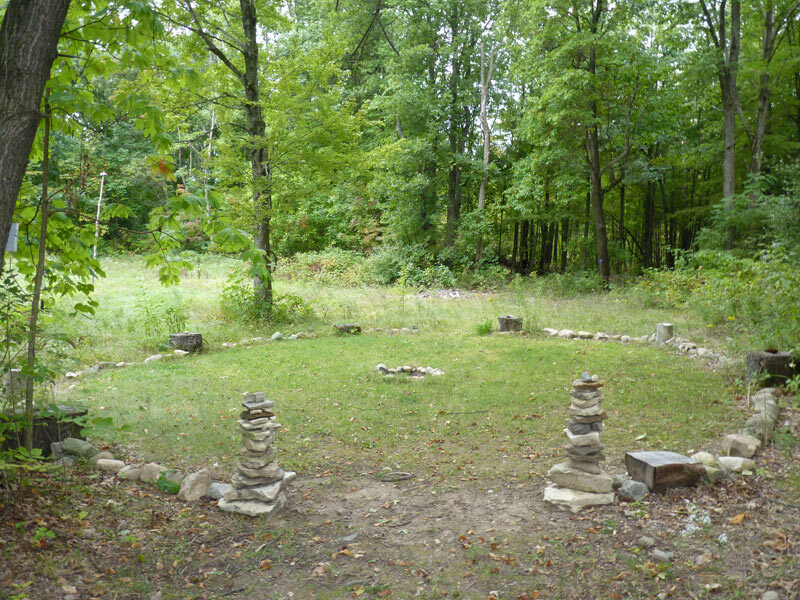 I have several posts on sacred spaces: developing sacred spaces, stacking stones, bee and butterfly gardens, stone circles and spirals, shrines and more. Reskilling. While any time of year is a good time to reskill, the spring is fantastic because it is a time of new beginnings, a very good time to clear away the old and bring in the new. Reskiling, or the practice of learning skills that allow for more sustainable skills, can help us begin to make the transition to lower-fossil fuel and lower-impact living. I have a post on reskilling where I cover the basics of this practice. Seed starting. At this point in the spring, if you haven’t already started your seeds or are considering a veggie garden, this is a great time to start those seeds! A lot of farmers and gardeners in my zone (Zone 6) plant their gardens on the 31st of May, so this is the time to start the plants that have an eight-week indoor growing time–and that includes most of the nightshades, such as the tomatoes, eggplants and peppers. Some info on seeds and seed starting is found here and here! Learning Homebrewing. 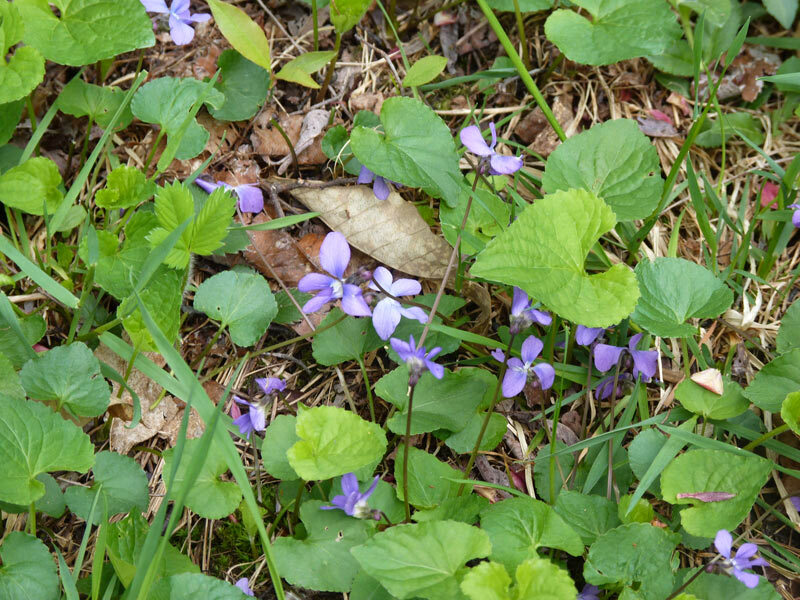 There are a fantastic array of spring beverages that one can craft–elderflower wine, spruce tip ale, ground ivy gruit, and my favorite, dandelion wine. If you want to learn about some of these unique brews, you can check out Stephen Harold Buhner’s book Sacred and Herbal Healing Beers: The Ancient Art of Fermentation. You won’t be disappointed! There are also many recipes to be found freely online, such as at the winemaking site. Amazing scenes from early spring! Early Spring Observations. I recommend that you take every opportunity to be outside, to live and breathe the spring air, to watch the ice melt, and generally experience the seasons. The melting ice, the rise of the crocuses, the running of the sap, the unfurling of the leaves–there is just so much magic in the land this special time of year! Spending time walking outdoors, being still, and focusing your awareness on the landscape and the tiny details can reveal profound insights and draw you closer to the land. I think one of my very favorite moments of the year is when we have the big melt, and being outside as much as possible during those amazing days! Reading and Study. 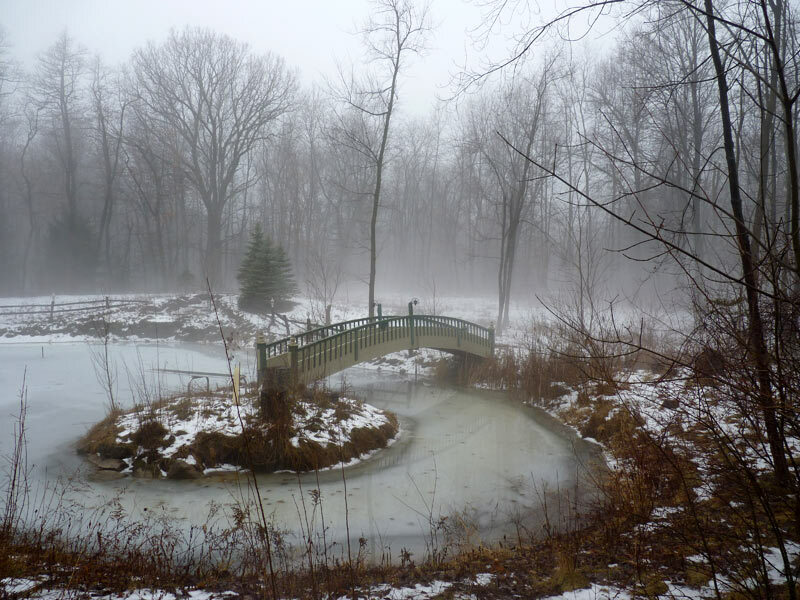 Like the Winter Solstice, for many of us, the spring equinox still has much snow on the ground and its an excellent time to read a few good books. I have a list of books recommended for homesteading here, and I also have listed some books for sustainability and druidry here. Its that time of year that if you haven’t already started your seeds, and you live in say, a zone 5 or 6 climate, you really need to start thinking about starting them! 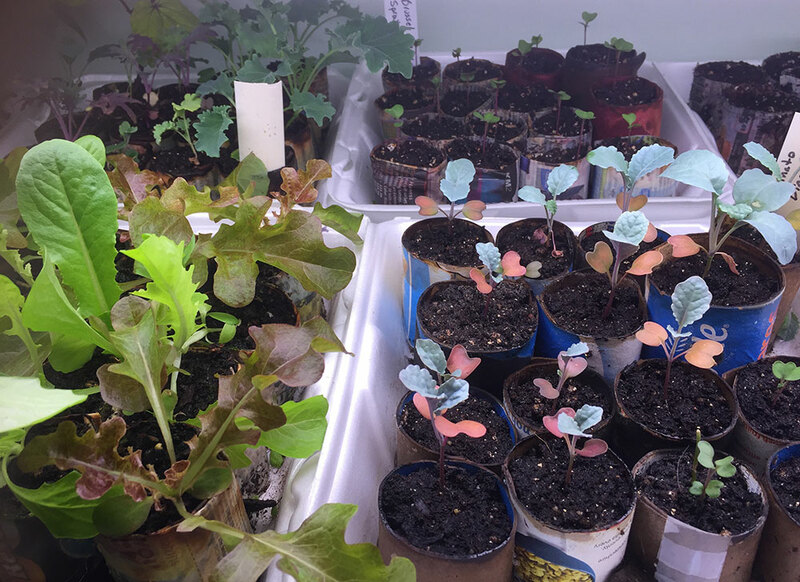 This blog post will talk about what I’ve learned about starting seeds from the last few years–it can be tricky with some plants, but its well worth the experience. Why start seeds rather than buy plants? There are a lot of reasons to start your own seeds, both practically and more energetically. Let’s start by examining the problems with purchasing plants from a nursery. First, nurseries have different tricks to get plants to appear healthy, and to make them look good to purchase, but in reality, a lot of the plants sold commercially are in a weakened, stressed state. If you pick up a nursery plant, and you see it already flowering, that’s a really bad sign. Why? A flowering plant means that it has already entered its reproductive cycle, rather than staying in its growth cycle for being planted in the earth. Another way that plants get stressed is when they are root bound in their containers (e.g. the roots are up against the sides of the container, even coming out of the bottom). They are already stunted, and transplanting them is further shock and stress. Furthermore, you also have no idea what chemicals and fertilizers were used to grow that plant–but chances are, they are damaging, and may even be fatal to bees and other pollinators. A stressed out nursery plant is going to have a harder time growing into a healthy, productive plant; that same plant may also going to potentially kill bees and other life in your yard (especially in purchased from big box stores). Finally, moving plants spreads disease and can cause you to have a lot more problems during the growing season. I had this happen last year–a friend was gardening with me, and he was running late on his garden, and purchased nursery plants (including tomatoes). I never had problems with blight before, but last year, all my tomatoes blighted badly. I know partly there were energetic reasons for this blight (as my linked blog post explores) but there were also practical ones. 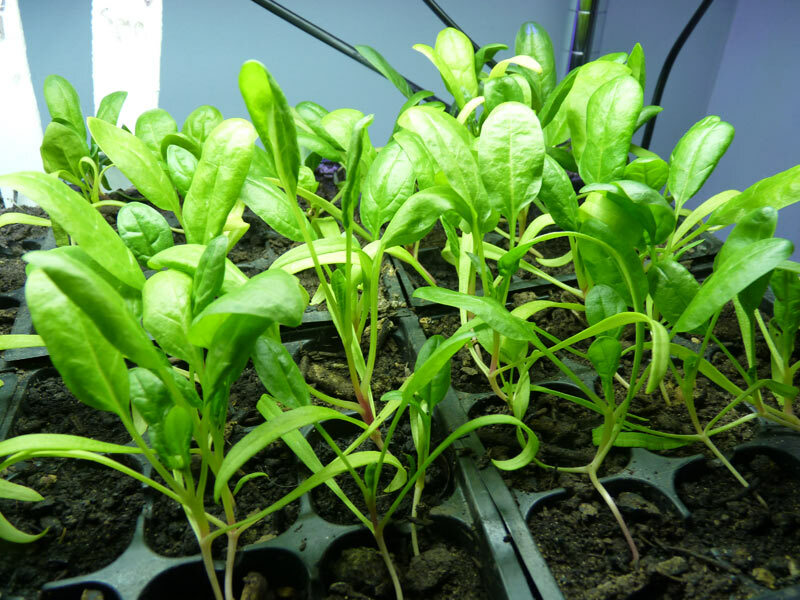 The benefits to starting your own plants from seed are incredible! 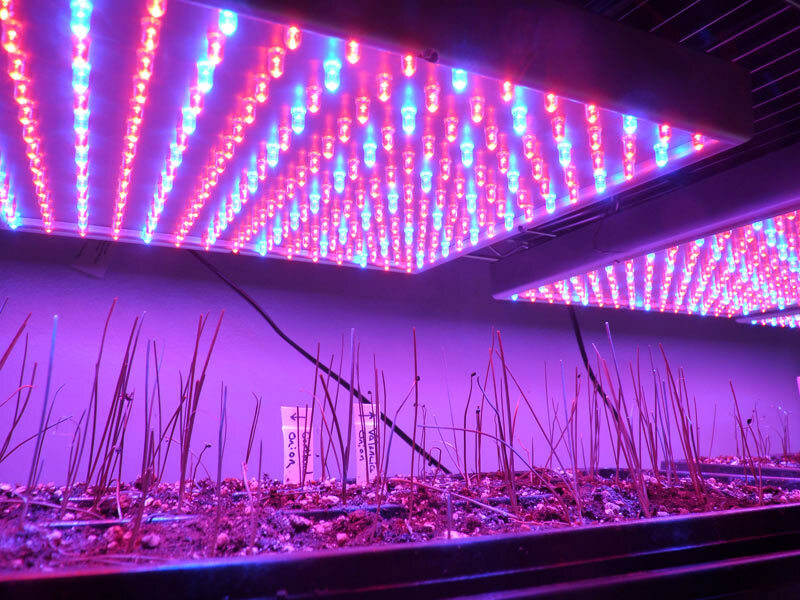 First, it is much more cost effective to start your plants yourself (even with the initial investment of grow lights or another setup depending on what light you have available). The variety of seeds that you are able to start is far superior to what you will find in a nursery–you can grow any seeds you like, and can also grow seeds that you saved from year to year. I save many seeds, and also purchase new open-pollinated/heirloom varieties to try. The ones that do well, I keep and over the years, these varieties become well adapted to my garden and climate. There is also the importance of establishing a relationship with your plants early and maintaining that relationship throughout the growing season. By starting seed, I am tending that plant through every phase of its life, and there is no greater reward than biting into that first ripe tomato after you’ve started the plant from seed. Seed starting is a magical, alchemical process that deeply benefits the grower. Seeds. So now that I’ve convinced you to start some seeds this year, what will you need? You’ll need some seeds–you can get these from a number of reputable seed companies (my favorites are Seed Saver’s Exchange, Victory Seeds, High Mowing Seeds, and Horizon Herbs) and/or ask friends who garden if they have extra seeds (trust me, they do). You do NOT want to just go and buy seeds off a rack at your local big box store–these seeds are not open pollenated (meaning you can’t save them) and most of the companies that produce the seeds are owned by Monsanto. Growing medium. You will need some growing medium–its best to start your seeds in some kind of seed starting mix. You can produce your own, or you can buy some locally. We have a small greenhouse near here who does a nice sphagnum moss/soil potting mix, and I usually use that. Growing flats. You’ll also need some growing flats. Since the big box stores want you buying their plants, you usually can’t find growing flats at the store. I usually get mine by the side of the road during “spring clean up” days, where people throw out their trash in giant heaps. I’ve found most of the tools for my garden and all of the flats I need this way. If you can’t find them, you can purchase them online or through local farmers in your area. Light and heat. You will need some way for your plants to stay fairly warm (most seeds like to germinate at a temperature between 60-70 degrees). You’ll also need to make sure they are getting adequate light (12-16 hours a day, direct light). Some seeds require light germination (like many herbs) but once they germinate, all require light. If you have a nice southern-facing window, you can put your seeds there (just check that they don’t get too cold at night). If you are like me and have practically no southern windows, you might need a grow light setup (see next area). Seeds in small cups from my sister’s growing setup! Water. Your seeds will also need water, so keep this in mind when you are setting up your seed starting area. Seed flats can be doubled with a solid flat on the bottom to avoid having water spill onto the floor. If you had, say, a spare greenhouse in your yard, this would all be a lot easier. Since most of us don’t have such a thing, we make do with what we have! Since I’ve been starting seeds for several years, each year I have worked to expand my seed starting operation a bit. I’m pretty happy with what I have now, and I think this is enough for my needs for the foreseeable future (until I get a greenhouse someday!) 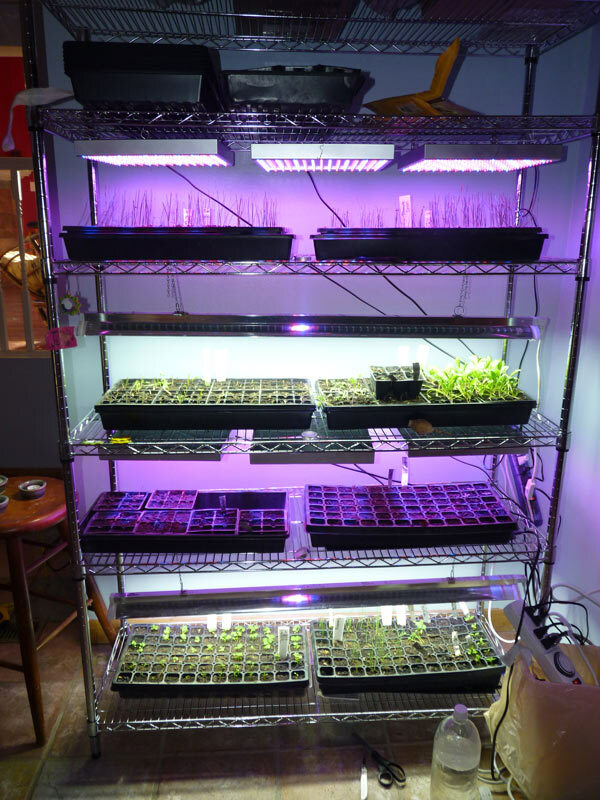 The seed starting setup I have now has six LED light panels (purchased online, they only give plants the blue and red spectrum and are highly energy efficient), two T5 lights (which use up a lot more energy) attached and housed to a metal rack. I also have two heat mats (my den is cold in the winter and I have trouble with germination without the mats). I have all of the seeds on a wire metal rack inside doubled flats so the water doesn’t drip out. 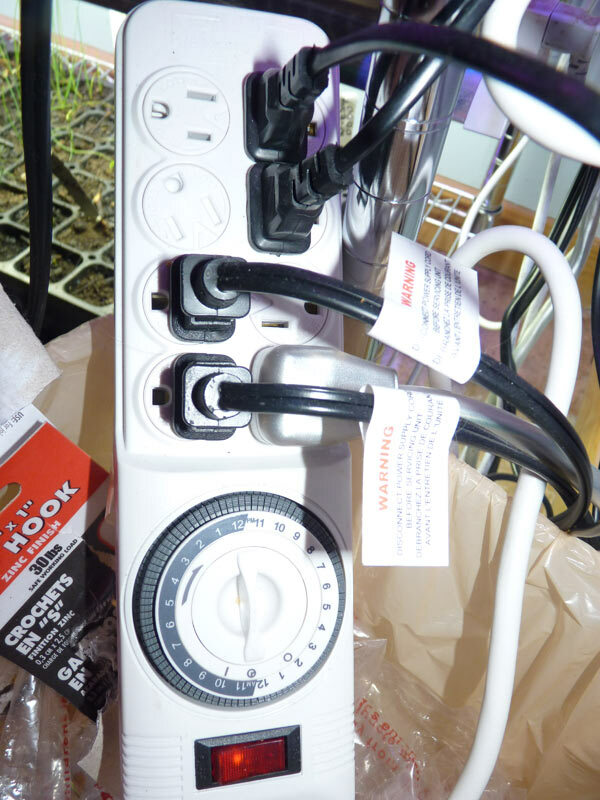 This setup cost several hundred dollars, but I justify it because I use it every year and when I’m not growing seeds in the late fall and winter months, I’m growing microgreens and sprouts using the LEDs! So this setup gets about 8 months of use a year–hence the investment in the LED lights. I wish I had a sunny window in which to grow these kinds of things, but with the way my house is setup, that simply isn’t the case. My seed growing rack – colorful! Timer keeps my plants happy and well lit. A second setup is something I helped my sister and brother-in-law with. They live in the city, and have limited space for growing things and limited light. This was their first year starting seeds. 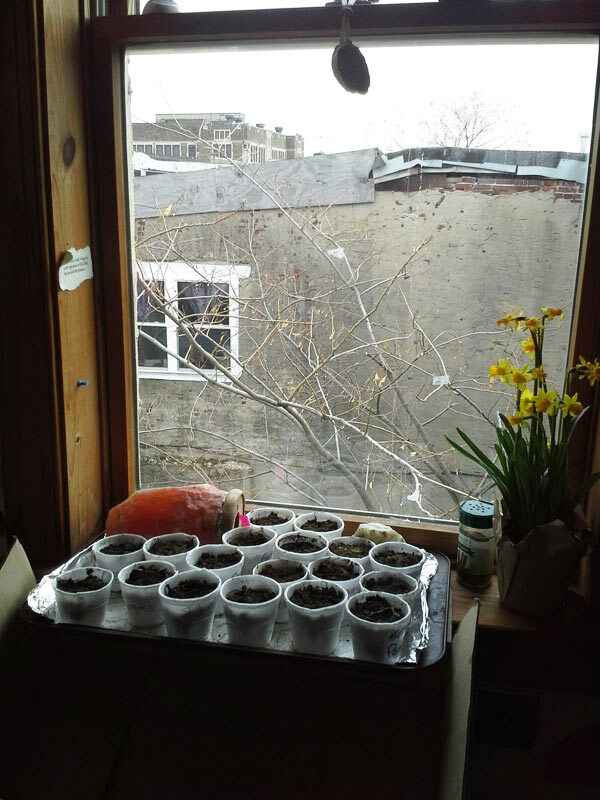 They had an eastern window, so what we did was plant seeds in small styrofoam cups cut short with holes poked in them (they picked the cups up in the garbage, new). We labeled the cups and placed them on a metal tray with some foil to protect it. 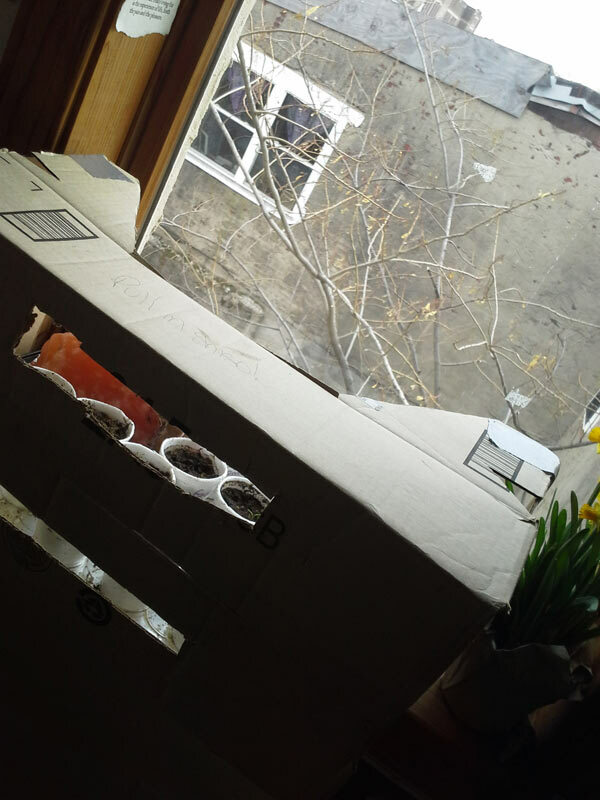 Then, to protect from cats and to further trap sunlight, we put box around the cups in the window. We put a small thermometer in the soil, and monitor the soil temperature. If it dips below 35 at night, the window will radiate cold, so they put the plants on a nearby radiator (radiating low amounts of heat). The Styrofoam does provide a good deal of insulation, however. I like this setup a lot because it uses existing energy flows in the house and repurposed existing materials. One of the things that can be challenging about starting seeds is figuring out when to start them, how many to start, and what care is needed. Seed packets often contain very general information, and I would recommend researching each plant that you are starting (sub-varieties don’t need to be researched; i.e. all tomatoes are started the same). Knowing something about plant families helps too–for example, I start most alliums (leeks, onions, chives) in late January to get a jump on their long growing time (garlic, of course, is started in the fall). I’m not going to lie–this process can get overwhelming. I’ve met quite a few novice gardeners (and remember my own experience years ago) with trying to figure out what to plant and when to plant. However, to aid in this process, I have a few suggestions. 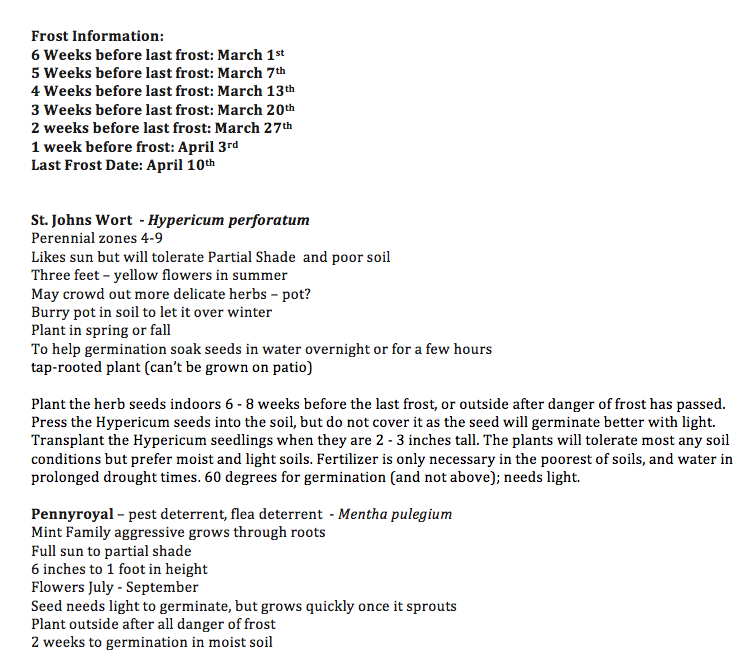 First, there are seed planting guides out there on the web that can talk you through the basics. In my opinon, however, the web is no substittue for an experienced farmer/gardener–so seek out advice from experts (or really, anyone who has done any growing–we all have knowledge to share). A friend this year gave me her whole biodyamic planting guide (see below), and that was super helpful. Second, it helps to take the seed research process in stages. Don’t start researching seeds in March when you need to get seeds going–research them in December, by the fire. I love to do this close to the holidays–its the perfect time of year to think about new growth. Then, by January, any new varieties I have researched are done and I have a planting plan moving forward. The other thing you can do is create note files and spreadsheets. 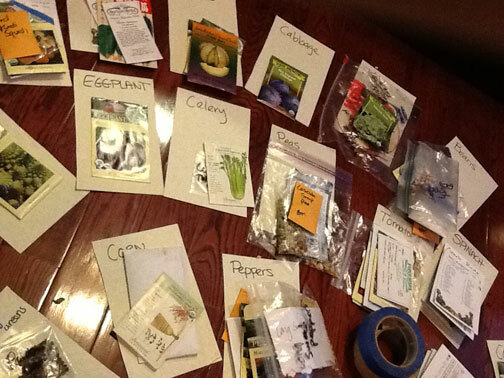 When I helped my sister with her herb garden, we looked up each seed she had and created a word file with information found on the packet and online. Here’s a screenshot of that file. Notice at the very top of that file, we also have a list of her last frost dates. This is critically important to know when to plant (because it tells you when you can set plants out). You count backwards from the average last frost date, and that tells you when to plant seeds. After we had this file (which turned out to be 10 pages for 15 different herbs, still a bit overwhelming because we also compiled growing and harvest info) we broke it down into a more simple spreadsheet with growing and planting instructions. Here’s a screenshot of the spreadsheet. Once the seeds were started, we highlighted them in green. Some of them had to be started a little later or cold stratified (e.g. set in the refrigerator for some time) so they didn’t get started on that day. If you are a gardener interested in the more esoteric side of things, you might also want to consider how the movement of the celestial bodies impacts plant growth. There are two approaches that I am aware of to this–biointensive and biodynamic. 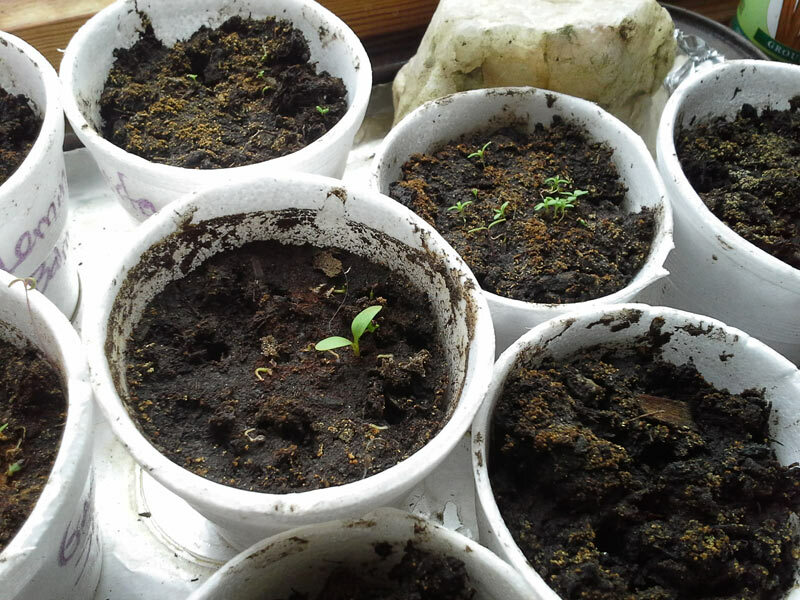 The biointensive growing approach advocates seed starting on the full moons or the new moons. The biodynamic approach advocates examining the relationships of the planets (using astrology) to determine planting times (among other things). Since the astroweather changes from moment to moment, you need to find a biodynamic calendar (unless you know enough about astrology to calculate it yourself!) I have experimented with both of these approaches, and both have merit, IMHO. After I plant my seeds, I spend time with them each day monitoring their progress and watching them grow. I find it pleasant to meditate near them, and they also respond well to music that I play from my panflute. Enjoy these early days with your seeds–soon they will be healthy vegetable and herb plants in your garden! I hope that the ideas presented to you in this blog post can help you make the most of your garden this year! Happy growing! There is so much magic in a tiny seed. Dormant, still, silent, the seed speaks of unimaginable potential. The seed is the first—and last—step in the cycle of most plant life; they complete the circle of life. Seeds can lay dormant for years, decades, and in some cases, centuries. When parched earth finally gets rain, when the fires die down and only ash remains—the seeds carry new life forth. Growing a plant from seed is a magical experience. Through this process, a magical transformation takes place both in the druid gardener and in the seed. You nurture and support the seed, giving it rich soil, light, warmth, and water. The seed nurtures you, providing lessons, healing, and strength. In the briefest of moments, the seed sprouts, sending tendrils up into the heavens and down into the earth, uniting the solar currents of the sun and the telluric currents of the earth. 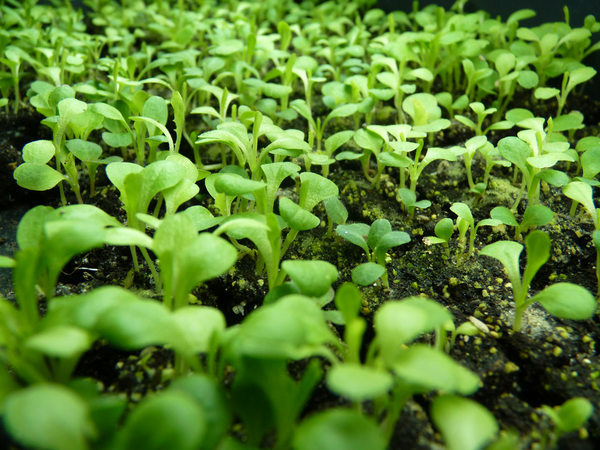 For some fast-growing plants, you can literally see them growing early in their life cycle. This same process is mirrored within the soul of the grower, hope and life are born anew. As the seed springs forth, its first two leaves (called cotyledons) are not “true leaves” but rather represent the seed’s first tender steps into a larger world. 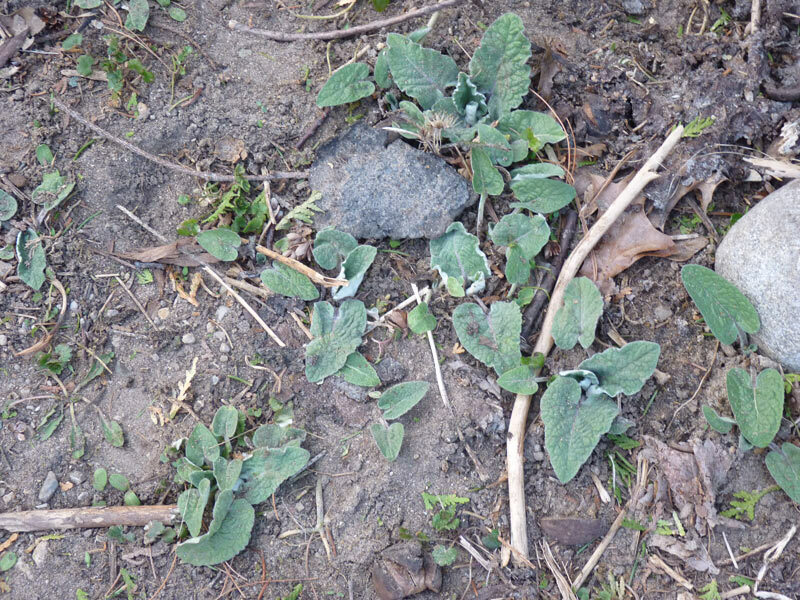 Once true leaves develop, the plant takes on the characteristics of its variety. Like a human infant, springing forth is only the first step of the journey of growth and development. I know that for many, the period between Alban Arthan and Imbolc can be challenging because of the darkness and cold. But I, sitting near my warm fire with the seeds of hope and life, enjoy such times. As a druid gardener, December and January are times of such joy, for these are the times when I return to my seeds. I spend weeks sorting through saved bags of seeds, remembering seeds given to me from friends, re-establishing relationships with seeds I have been saving for years, or studying new seed packets I purchased. Part of this is just to reconnect to the plants, to look forward to what is to come. But, this is so I can plan how much seed I need to start and when I need to start it. For the seeds I’ve saved, I think about the relationship I’ve shared with that plant, that strain of seeds. 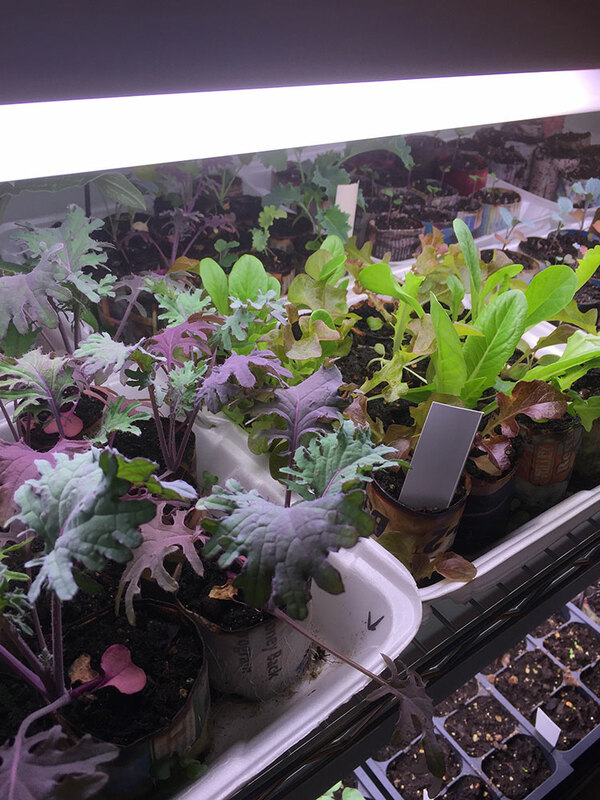 Now in my fourth year of serious organic gardening, I have strains of kale, lettuce, beans, tomatoes, corn, peppers, and herbs that I have had many years of friendship with—the seeds represent a way to carry our connection through the darkest of times before it begins anew. As I sit with my packages of seeds, I reflect upon our past history and look forward to future harvests. This year, dear readers, I suggest that you sow at least a few seeds. If you have the space for a larger garden, consider sheet mulching an area in the spring and planting some vegetables. Create a sacred garden space for growth—of the druid and of the garden. Growing a bit of your own food puts you in a sacred relationship with the land and its cycles—and all of it begins with the seed that you grow. If you only have room for a few pots on a porch or a windowsill, you can still experience the magic and teachings of the humble seed. I suggest starting some herbs (mint, oregano, or chives are all very easy to grow) or growing some vegetables in containers. Once you start your seeds, consider your relationship to the plants. I have found that plants really enjoy music, and I play my flutes and panflute for them often. I speak to them, listen to their stories and secret tales, and open myself up to their teachings. This is a very personal process, but you will your way. Meditation with the seedlings can provide great insights. Connect with the spirit of that plant—each species has a spirit, and you can see that spirit out and learn from it. If you decide to start seeds, ask around. Chances are, someone you know has seeds and is willing to share. If you are purchasing seeds, it is important to know that not all seeds are created equal. The seeds of our ancestors were all what is now known as “heirloom” and “open pollinated” and could be easily saved from year to year and were adapted to the localized climates that they lived in. The seeds of today—including nearly all you would purchase in a big box store—are often genetically modified and hybridized. GMO and hybrid seeds are modified so that you can’t save them, and often have other modifications to the plant and/or are treated with chemicals. Energetically, these seeds represent the worst of humanity’s shattered relationship with nature, and buying them supports industries that are actively causing harm to our planet. For seeds that are open-pollinated and heirloom, you can visit the Seed Saver’s Exchange, Horizon Herbs, Baker Creek Heirloom Seed, or High Mowing Seeds. For information on how to start and save seeds, the book Seed to Seed: Seed Saving and Growing Techniques for Vegetable Gardeners (Ashworth and Cavagnaro, 2002) is a wonderful reference and one that I have used for many seeds. I also have a post on seed saving spinach and lettuce seed this blog. There is no greater magical gift in the world than that of a seed, and no greater magical act than that of growth. If you have questions about seeds, seed starting, or magical gardening please feel free to contact me or respond here. *I’d also like to acknowledge that some of my insights gained in this post came through mediation from the first knowledge lecture in Greer’s Celtic Golden Dawn system (which I have been studying for the last 8 months).